Visual Filters provide a mechanism for filtering out parts of a diagram or list of elements that are not of interest, leaving just the elements and connectors that are relevant to the view. The filters can be defined for elements or connectors and there is a wide range of criteria that can be set, such as filter out all elements that don't have a status of 'Validated' and were created since a milestone date. Model stakeholders typically have different interests and often only part of a diagram or element list will be relevant to them. 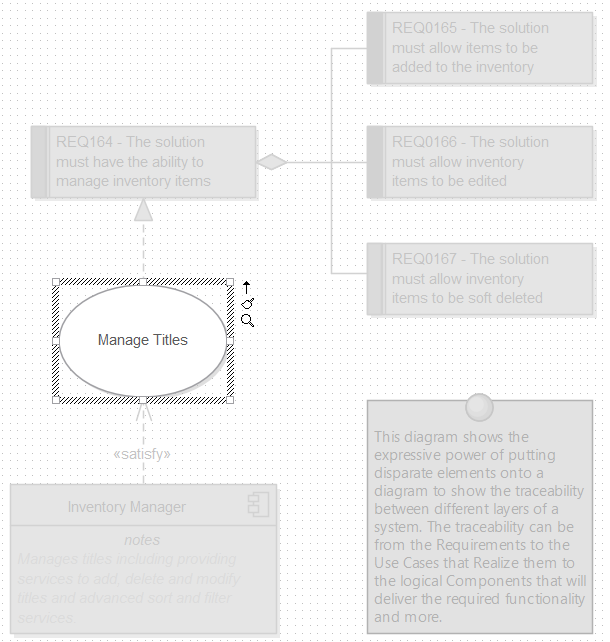 Visual filters can assist by allowing you to filter out parts of a diagram or list of elements leaving just the elements and connectors that they want to see. This is a powerful tool in workshops, focus groups and meetings allowing a modeler to present a single diagram in many different ways. Visual Filters can be defined at a Repository level making them available to all users. The application of the filter is however specific to the current user, so two analysts could apply different filters to the same diagram or list simultaneously. There are a number of options available from the Visual Filters Toolbar including being able to change the way the element obscuration is presented from: Fade, Gray Scale, Hide and Select. Context filtering can be applied so that only the element selected in the diagram and its directly connected elements will be enabled, this can be enabled from the Visual Filters window Context Menu. The filtering effect can be to hide, fade or gray scale the irrelevant elements; the Select option will conversely select the elements of interest in the diagram or list.